Mule deer buck photos are among my favorite. Mule deer, Odocoileus hemionus, are found throughout the Rocky Mountain West. Mule deer are native only to western North American. Mule deer occupy diverse and varied habitat types from mountains, to prairie grasslands and forests, even river bottoms. They have fantastic eye site, can hear extraordinarily well, and have acute smelling capabilities. Mule deer were engineered to see long distances, hear the most subtle noises, and smell threats from long distances. Mule deer numbers by some estimations are nearing all time lows. In some local regions mule deer numbers are up, but across their entire range they continue to decline. Mule deer numbers are on the decline due to a number of factors including habitat loss, urbanization, depredation, extractive energy development, and competition from other species like elk. Mule deer are the subject of various studies across the west. Habitat fragmentation is likely the main cause of their recent decline. Mule deer are also one the most coveted big game trophy species in North America. Hunters from around the world come to North American to hunt mule deer. Hunting regulations are relativity strict in some areas while other areas allow for an almost unlimited harvest. Mule deer are are my favorite animal to photograph. Mule deer photography is a challenge. As with other species, it's not difficult to find or photograph mule deer, but capturing unique behavior and creating lasting, beautiful photographs of mule deer is a challenge. Mule deer grow a new set of antlers every year. In the late winter their antlers are cast and new one's begin to grow imidiatly. The fleshy new growth is called "velvet." Each ear of a mule deer's life his antlers grow larger until he passes his prime - seven to eight years - then then his antlers begin to grow shorter but usually fatter. Mule deer bucks spend summers and early fall in bachelor herds usually, but not always in peer groups. Once fall begins the "velvet" sheds, or is rubbed off, and the antlers become bone hard. Mule deer mating season varies across their habitat area starting sometime in mid November in their northern range and early to mid December in their southern range in Mexico. Below is a selection of mule deer buck photos. The images on this site are property of Tony Bynum. Any removal, clipping, or downloading for any reason is a violation federal copyright law. 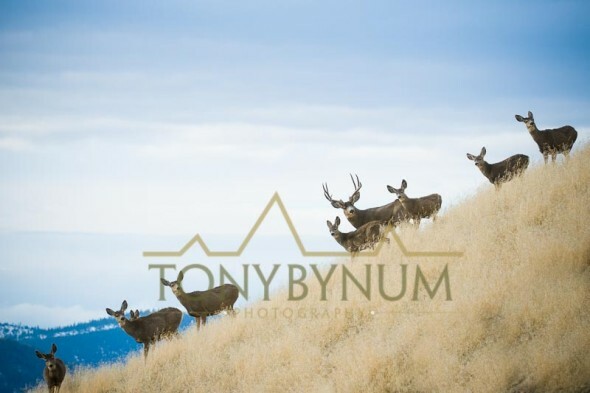 For more mule deer buck and mule deer in habitat photos please contact Tony Bynum.